There are a few products that I like to use everyday and I just discovered some new ones! 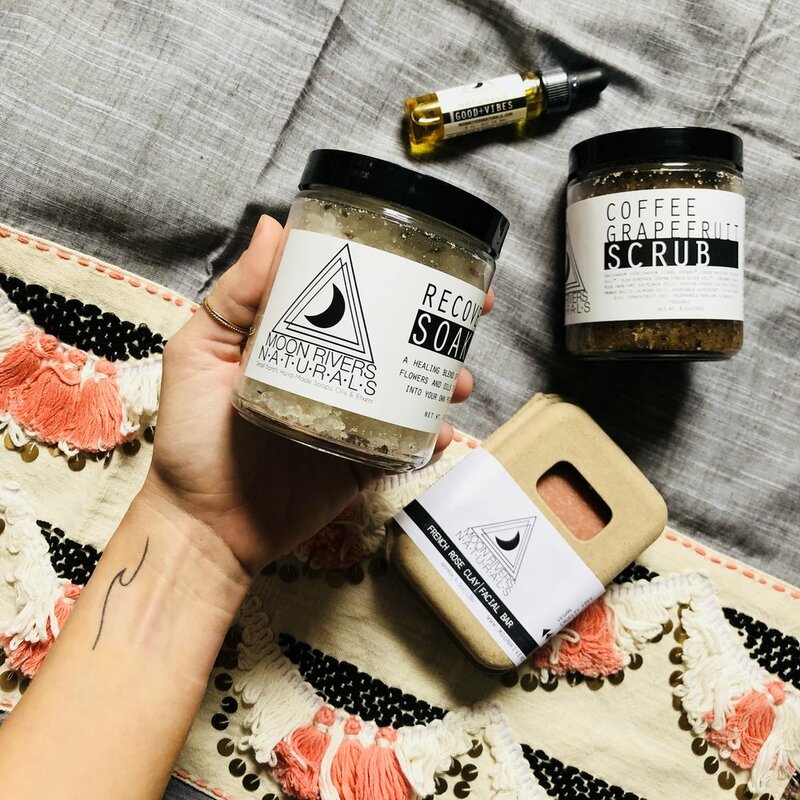 I am a total sucker for beautiful packaging and businesses started from the ground up, just like Moon Rivers Naturals! Not only are they a family run company, but everything is small batch made so you know its the good stuff. I recently have started looking to oils for skin assistance and to just plain calm my spirit after a long day and these products were perfect! Moon Rivers sent me a French Rose Clay Bar, Recover Salt Soak, Coffee Grapefruit Scrub, and some Good Vibes oil. 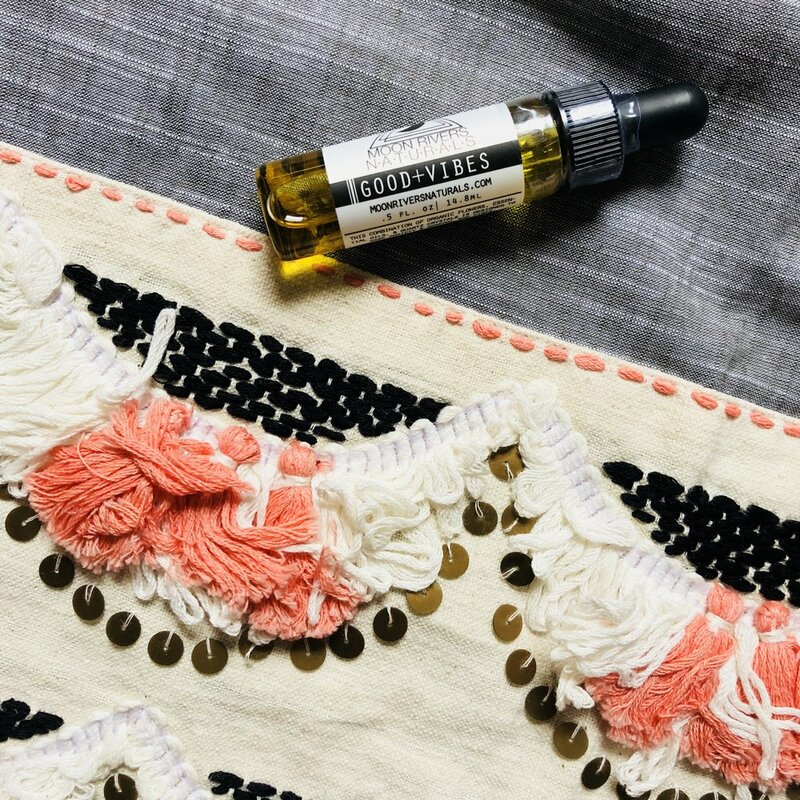 I start with the oil and it has officially found it's home in my purse to be taken everywhere! It has a hint of peppermint (calming qualities), lavender (my favorite scent), and pure quartz crystals. I like to put a little dab on my wrist and I can smell it all throughout the day! Not only are the products beautiful, but the script on them is wonderful! Recover Soak is to "recover from after your workout, or booze induced binge shopping....." I will definitely say that I am victim to the later. The salts fill up the whole bathroom with scent, a total calming experience. So sit back and relax, ladies! If you're looking to smooth and tighten your skin, the Coffee Grapefruit scrub is for you! The scent is amazing, but also helps to tighten skin with the caffeine of the coffee. Who doesn't want to smell like coffee all day? Finally I tried my Rose Facial Bar! I am one of those people who is super cautious of what I put on my face, but after two days of using morning and night there was no extra dryness and I was feeling super smooth. The bar has oat flour and essential oils for a calming quality and another amazing scent! I can't get over how good everything smells! If you're looking for some trustworthy, totally natural, and even aesthetically pleasing products I can't recommend Moon Rivers enough. Trying any of their other products? I would love to hear from you, feel free to leave me a comment! Check out www.moonriversnaturals.com !! !